Last week, I swapped my old-ish Intel 4965 802.11n PCIe mini adapter for a hot new Intel 6300 PCIe half mini card. Good news. My update was a success…so far. I learned a few things along the way that could be helpful to someone else out there running Windows on a Lenovo laptop. 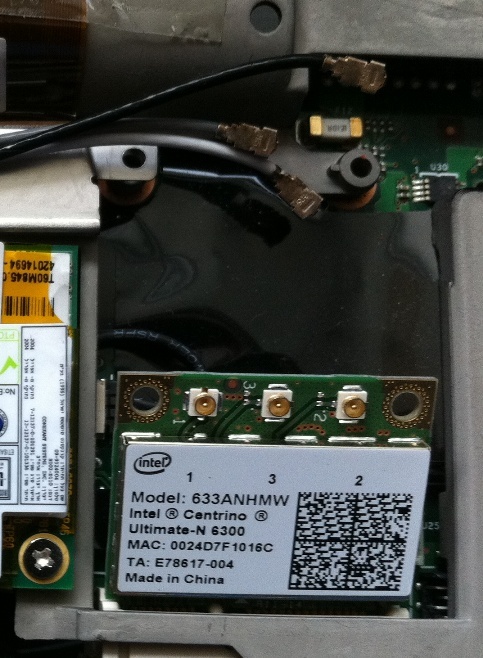 While changing the internal Wi-Fi adapter on a Lenovo T61 doesn’t seem as “tutorial worthy” as doing the same with a Mac, there can be some gotchas along the way. First off, Lenovo is a little bit like Apple in that they try to control things. :) Lenovo’s BIOS restricts the types of supported wireless cards with a whitelist. That is, there are Lenovo wireless cards and non-Lenovo wireless cards. So if you go out and buy a shiny new internal WLAN piece all willy-nilly, you may find yourself giddy with excitement—we are nerds, after all—for nothing. After installing the non-Lenovo card and booting up, the BIOS will kindly remind you that the wireless card is not supported. I speak from experience. Apparently, the reasoning for the whitelist is to abide by FCC wireless transmission system certification requirements. A transmission system is a complete “system,” so if any part of the system changes, you no longer have a certified system. Lenovo is sort of playing traffic cop for the FCC’s certification policy. But, in the meantime, a Lenovo wireless card that is on the whitelist can cost as much as 3 or 4 times the same non-Lenovo wireless card (starting to sound more like Apple?). 1. Pay more for an adapter that is in the Lenovo whitelist. 2. Hack the BIOS whitelist to add the PCI-ID of your non-Lenovo card. 3. Install a modified third-party BIOS that removes the whitelist BIOS check altogether. Because I’m both frugal (I blame my parents) and not comfortable making changes to the BIOS myself, I opted to use a third-party modified BIOS that has a pseudo-reliable reputation. It removes the whitelist problem altogether, but of course, introduces the risk of using a non-Lenovo modified BIOS. Thankfully, I had a lab PC on which I could test both the BIOS and the wireless card before I put them on my productivity laptop. In addition to making software changes, moving from PCIe mini to PCIe half mini hardware introduces some basic installation problems. 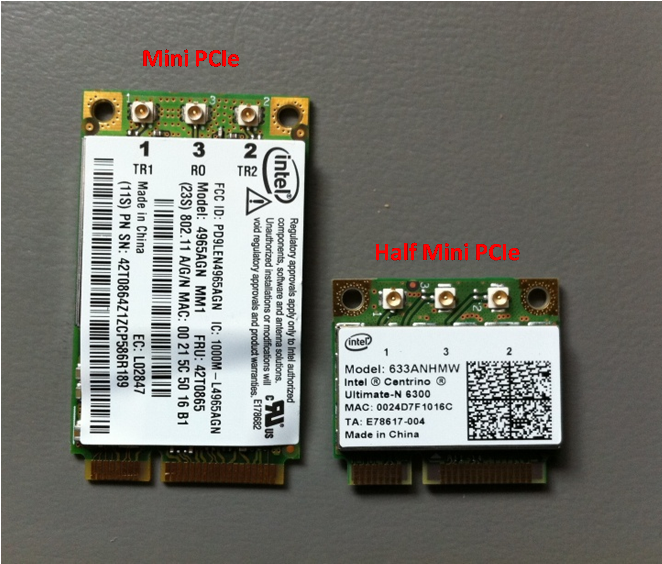 As shown in the photos below, the PCIe interfaces for half and full are the same, but the half profile does not fit the laptop mounts designed for full mini PCIe. With the card mounted to the bracket and the bracket mounted to the laptop, the whole outfit is secure. I had to tease out a bit of extra antenna cable to make it reach to the card as well. Finally, whenever you replace an internal WLAN adapter, you should start by asking about the existing adapter and antennas. 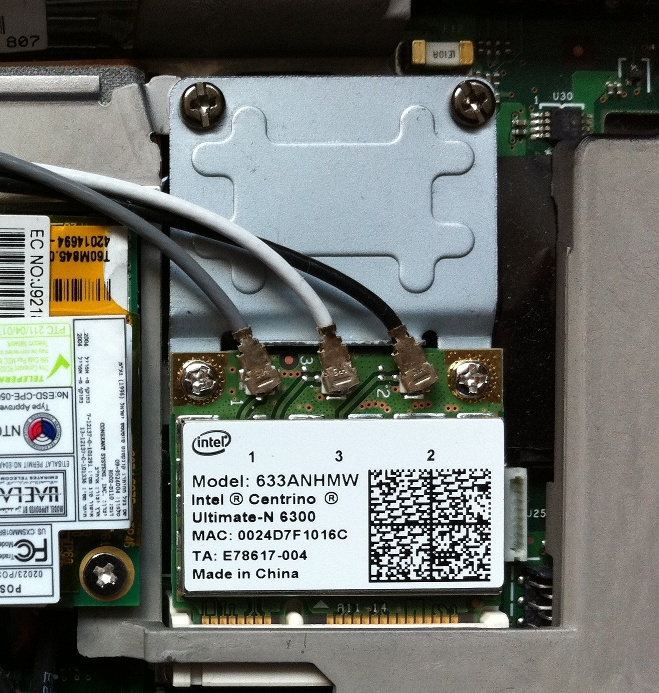 In my T61, my previous card was a 3x3:2 802.11n card (Intel 4965), so I already had three built-in antennas with U.FL connectors. The new 3x3:3 card required the same antenna count and connector type. Despite the fact that my previous card only supported two spatial streams, it still used three antennas, making it suitable for the upgrade to 3x3:3. If you have an 802.11a/g card with simple diversity, there will only be two antennas, thus you would be better suited to upgrade to a 2x2 802.11n adapter. Most card manufacturers do not recommend installing a 3x3 card with only two antennas. Kids, try this at home. Tinkering with WLAN hardware is a great way to learn about adapter form factors, antenna connector types, and computer hardware as well. If you’re attempting to replace existing wireless hardware on a laptop, double check the specs of your existing adapter and antenna hardware. Check primarily for the form factor of the card and the number of antennas. And if you’re using a Lenovo laptop, don’t forget that they include a BIOS whitelist that prevents non-Lenovo wireless adapters from working (the OS will not boot), unless you make BIOS modifications. You can buy Lenovo wireless cards, but they usually cost more. Upgrading wireless hardware will put a smile on your face. After just a few days of normal use, I still have not achieved 450 Mbps connectivity, but 405 Mbps is still pretty darn good.